Republished from John Krygier’s Making Maps: DIY Cartography. 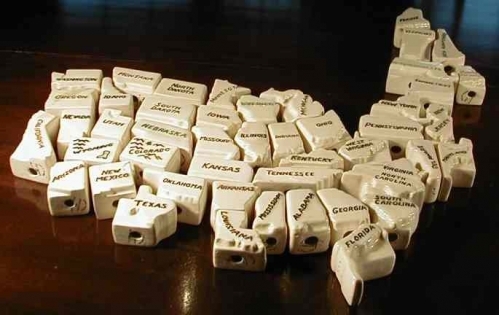 A set of salt and pepper shakers, one each for the 48 contiguous U.S. states. Read more at Making Maps: DIY Cartography . 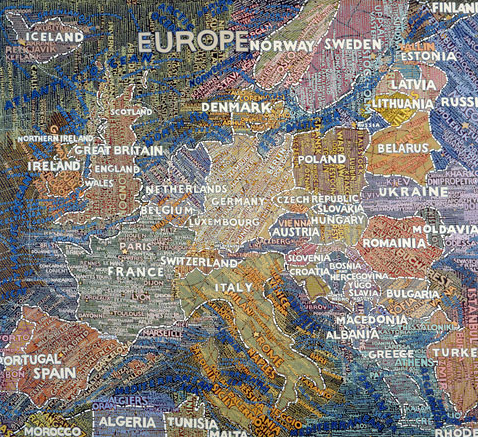 . .
Paula Scher: Maps as Tag Clouds?! 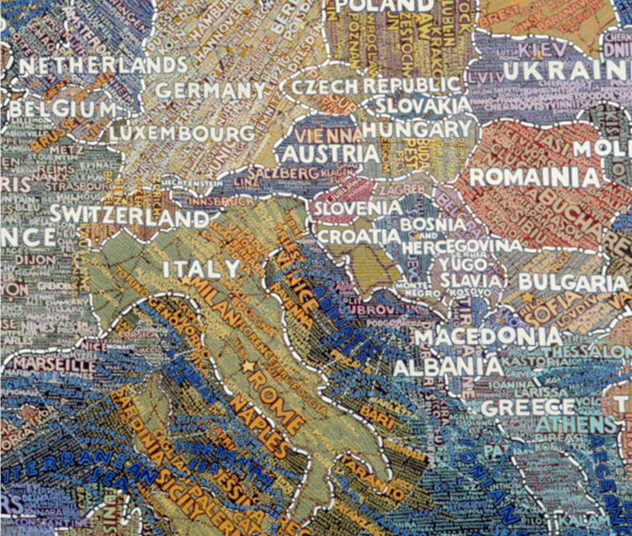 Paula Scher has produced a series of nifty map art that focuses more on placenames than their locational placement. The placenames are in correct “relative” space but not absolute space. The names all run together in a placename tapestry where they swirl in colorful waves and eddies. Thanks Curt! Maya Stendhal Gallery is pleased to announce a solo exhibition of renowned artist and graphic designer Paula Scher, which runs from November 8, 2007 through January 26, 2008. Scher expands on her highly acclaimed Maps series to create her most engaging work yet, depicting entire continents, countries and cities from all over the world that have been the critical focus of attention in recent headlines. Through an acute understanding of the powerful relationship between type and image, Scher harmonizes witty with tragic, the methodical with the intuitive, and the personal with the universal in these new paintings. Dynamic images are saturated with layers of elaborate line, explosions of words, and bright colors creating a plethora of visual information that produces an emotive response to places lived, visited, and imagined. Scher’s maps also reflect the abundance of information that inundates us daily through newspapers, radio, television, and the Internet to reveal the fact that much of what we hear and read is strewn with inaccuracy, distorted facts, and subjectivity. On view will be Tsunami (2006) depicting the area that was ravaged by the destructive natural force on December 26, 2004. Evoking memories of compassion and grief, the image is covered by a swirling vortex of words denoting towns, cities, and areas, which echo the violent rotation of that monumental storm. Paris’s (2007) bold blue and white péripherique rigidly maintains the city’s borders. While inside, Paris as we know it beams in a captivating latticework of blue, yellow, green, and purple exuding the city’s sense of vitality and charm. China (2006) shows a colossal landmass with cities, provinces, and roads pulsating in reds, blues, greens, and yellows. Listed above are the astounding statistics that make China one of the world’s great centers of capitalism and culture. Manhattan at night (2007) glows in deep jewel tones of purple, blue, green, and black. This enchanting quality is sobered as the median incomes of various neighborhoods disclose the very different realities of city residents. NYC Transit (2007) projects the city in intricate layers of line, text, and color that culminate with the iconic map of the New York City subway system. The major outsourcing destination of India (2007) takes form in a giant pink landmass accented with bright blue and green road markers and orange location names, which give the impression of a sign for its popular Bollywood industry. Israel (2007) presents the country and bordering countries including Egypt, Palestine, Jordon, Syria, and Iran. Text representing cities and regions is written in varying, haphazard directions communicating a visual sense of conflict and discord. Middle East (2007) segregates the area by rendering each country in its own bold color. The land’s sordid past is remembered through hatch marks and dots representing the Babylonian Empire, Moslem Empire, Ottoman Empire, and Roman Empire. Ms. Scher began her career creating album covers for CBS Recordings in the 1970ís. She moved on to art direction for magazines at Time Inc., and in the 1980ís formed her own boutique firm, Koppel & Scher. She has been a principal at the New York-based Pentagram design consultancy since 1991, where she has created visual identities for Citibank, The New York Public Theater, and the American Museum of Natural History, among others. Andy Woodruff over at the Cartogrammar blog has a post that lists other tag cloud like maps with images.